China used to brag that it never interfered in other countries' business. Whenever someone complained that China massacring peaceful protesters or Tibetans or Uighurs, Chinese officials would say that it's an internal matter, and just as China didn't criticize other nations' internal matters, other nations should just leave China alone. "As a responsible major country, China has something to say. China will resolutely uphold the authority and status of the United Nations, actively fulfill China's international obligations and duties, remain firmly committed to China's pledges to tackle climate change, actively push for the Belt and Road Initiative, and always be a builder of world peace, contributor of global development and keeper of international order. The Chinese people are ready to chart out a more prosperous, peaceful future for humanity, with people from other countries." One can only shrug and wonder what much of this means. With regard to upholding the United Nations, the United Nations Permanent Court of Arbitration in the Hague has already ruled that China is an international criminal. ( "13-Jul-16 World View -- Philippines humiliates China in harsh Hague Tribunal ruling over South China Sea") China is also the principal supporter of Russia in illegally annexing Ukraine's Crimea peninsula. China has no intention of upholding the authority of the United Nations, except selectively for its own benefit. Xi Jinping says that China will "always be a builder of world peace, contributor of global development and keeper of international order." Does anyone seriously believe that? I've gotten quite a bit of reaction to my October 24 World View article, Xi Jinping's 'Socialism with Chinese characteristics' is identical to Hitler's National Socialism. In that article I wrote that the Chinese people themselves have become almost completely delusional. Press reports indicate that many Chinese, especially young Chinese, believe that China's Socialism has already beaten the United States. They believe that because China is a dictatorship, it can accomplish things that a democracy can't, and therefore can defeat the Western democracies at any time of their choosing. The things that I've been told are all anecdotal, but they're consistent. Chinese people consider themselves superior to Americans and other Western people, and expect to use military power (war) to dominate the world, and set up a "new world order." "The Chinese are arrogant, rude, intolerant, loud, demanding and overbearing. They flaunt their wealth and rule over underlings, especially foreign ones, with an iron fist and a bamboo rod. Other Asians despise them and wherever they go as tourists they are disliked and held in disdain as being little more than peasants with credit cards." I keep comparing the Chinese today to the Nazis of the 1930s, and the points of comparison keep growing. The Chinese seem to consider themselves to be the "Master Race," just as the Nazis did. The Chinese consider it their right to annex regions belonging to other countries, just as the Nazis did. And the "Socialism with Chinese Characteristics" is the same as Nazi's "National Socialism." A lot of these impressions are anecdotal, but they're consistent. If there's are any Chinese people out there who think that I'm wrong, then please write to me and tell me that I'm wrong and why. Because I would very much like to be wrong. I frequently quote Friedrich Nietzsche and I do so again now: "Insanity in individuals is something rare - but in groups, parties, nations and epochs, it is the rule." If Xi Jinping's speech sounded delusional about foreign policy, it sounds totally wacky on economic issues. "It would be the first time in thousands of years of Chinese history that extreme poverty had been eliminated. It is our solemn promise. Only three years are left to 2020. Every one of us must be called to action, do our best ... This is a great cause, important to both the Chinese nation and humanity. Let's do it together and make it happen." Just in general, the whole "poverty" concept is largely a hoax. Regulators always define the "poverty line" that separates the poor from the rest, so that there are always 10-12% of people in poverty. This is a matter of definition. Whatever algorithm regulators use to define poverty, it always comes out so that 10-12% of the people are in poverty. No matter how wealthy a country is, there's always a poorest 10-12%. So by definition, poverty can never be cured. So here's Xi Jinping promising to end poverty in China by 2020, three years from now. China is known to lie about economic statistics, and it may simply be that Xi Jinping believes what his government tells him. China claims an annual 6.9% growth rates, but I've heard many analysts claim that the true figure is close to 1%, and that the 6.9% figure represents increase in debt, rather than increase in growth. This is a subtle distinction that may be beyond the understanding of a politician like Xi Jinping. Xi's speeches have been promising aggressive development of China's "Belt and Road Initiative" (BRI). In this vision, China will be building towns, cities, buildings, roads and other infrastructure throughout Asia, and continuing all the way to Europe. In the oceans, China will be making new alliances and numerous ports for Chinese ships, putting China at the center of a new world order. The International Monetary Fund (IMF), Bank of International Settlements (BIS), Moody's and S&P have all expressed alarm at China's ballooning debt, and are predicting a major correction. This is consistent with the Generational Dynamics prediction of a global financial panic and crisis. We must mass-produce nuclear warheads and ballistic missiles and speed up their deployment." Well, it's the beginning of the New Year. There were 365 days in 2017, and I posted 365 Generational Dynamics World View articles. I didn't miss a single day. A perfect record. That just proves what an obsessive mind is capable of. When I started writing daily articles in January 2010, I wrote "Dear Reader, I'm going to try this for a while and see if it works for me. Ideally I'll produce a news summary every day, but that's probably unrealistic. I'll try to do it as often as possible." Much to my own amazement, I'm still doing it every day eight years later. I started the Generational Dynamics web site in 2003. Since then, I've written almost 6,000 articles containing thousands of Generational Dynamics predictions and analyses, all of which have come true or are trending true. None has been proven wrong. 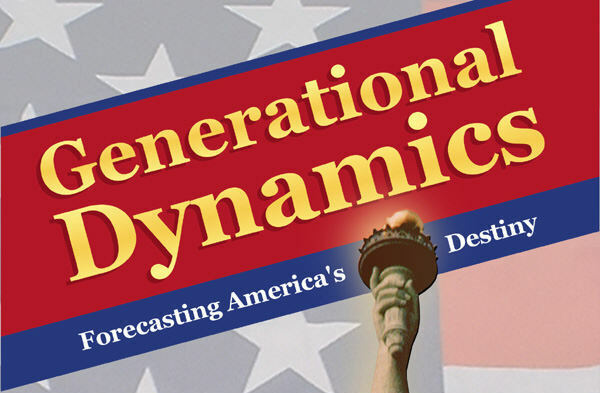 No web site, analyst, journalist, or politician has come even close to the analytical and forecasting success of GenerationalDynamics.com. Generational theory is truly amazing, and a truly historic development. Now it's 2018, and we're looking forward to an extremely dangerous year, with crises in North Korea, China, the South China Sea, the Mideast, Crimea, Africa, and elsewhere. Any one of these crises could spiral into something bigger. As we've reported recently, even Chinese officials are saying that they expect a war over North Korea in the next few months. If you want to forget about what's going on in the world, then just focus on the politics of the Russia dossier or the latest sexual harassment accusation. But if you do want to know what's going on in the world, then the #1 most accurate source in the world is the daily Generational Dynamics World View articles. You can read them every day on http://GenerationalDynamics.com and on the excellent Breitbart National Security web site, or you can subscribe, and receive them for free every day in your inbox.